Remarks:HPGDS inhibitor 1 is a novel and selective Hematopoietic Prostaglandin D Synthase (HPGDS) inhibitor with an IC50 Value of 0.7 nM.IC50 Value: 0.7 nM ,HPGDS inhibitor 1 was elected for further profiling based on its enzyme and cell potency. The compound illustrated equal potency against purified HPGDS from human , rat, dog, and sheep (IC50, 0.5-2.3 nM). HPGDS inhibitor 1 was profiled in a panel of cellular assays to screen for activity against several relevant human enzyme targets. Those assay indicated that HPGDS inhibitor 1 does not inhibit human L- PGDS, m-PGDS, COX-1, COX-2 or 5 LOX (IC50 values > 10000 nM). 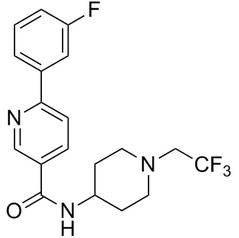 HPGDS inhibitor 1 had a solubility of 1.5 ug/ml (3.9 uM) at pH 6.5. The compound had excellent PK characteristics when dosed in rats at 1 mpk with 76% bioavailavility. Rats dosed orally with 1 and 10 mpk HPGDS inhibitor 1 were sacrificed at various times, and plasma concentrations of HPGDS inhibitor 1 and spleen PGD2 concentrations were measured. Oral administration of HPGDS inhibitor 1 blocked PGD2 production in the rat spleen; inhibition of PGD2 was inversely correlated with the plasma concentration of HPGDS inhibitor 1 in a time and dose-dependent manner. Spleen PGD2 levels fall as HPGDS inhibitor 1 plasma levels increase over time; PGD2 levels return to baseline levels as HPGDS inhibitor 1 plasma levels decline.